Supermarkets are where I generally buy non-food items like cleaning products, toiletries and some non-perishable food items. It’s not a place that I buy fresh food from. Over the weekend as my dad stocks up for the restaurant at the markets, he will put aside a few things for me in a box. I get fresh fruit and vegetables (mainly Asian vegetables like kai lan, choy sum or boy choy) every Monday when I go over to my parents for dinner. I buy most of my other food from Asian groceries, markets, butchers and bakeries. So I don’t eat much supermarket food nowadays but as I was growing up, a lot of the mass produced supermarket products were my first introduction to many of the foods I now love and either make myself or have found other sources for a more quality product, especially baked goods. Supermarket lamingtons, chocolate mudcakes, swiss rolls, donuts, assorted danishes and Tip Top soft white bread without crusts were staples in my lunchbox for school. It was food that I would have to be on my best behaviour for to get my parents to pop them into the trolley as we did our weekly shop on the weekends. Food that was full of some magical combination of salt, sugar, fat and artificial flavourings that tempted and satisfied a little girl who didn’t know any better. Now I find all these products to be bland or just too sweet and one dimensional in flavour. My first cheesecake was a Sara Lee cheesecake. Everyone’s grown up on Sara Lee cheesecakes right? I love eating cheesecake. It’s one of my favourite desserts but unless it’s a baked cheesecake I have no interest. 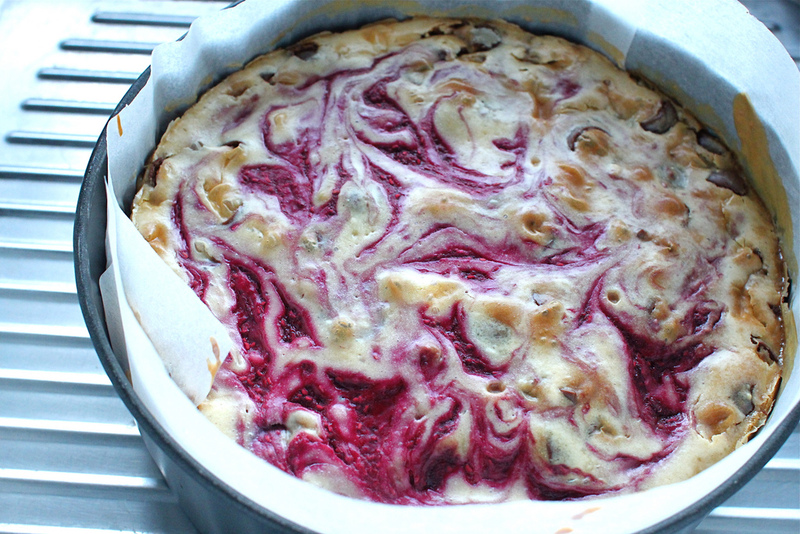 I love the taste and texture of a baked cheesecake – it’s dense but velvety with a smooth and thick creamy consistency. A no bake cheesecake is easier to make as all you need to do is mix together all the ingredients with some gelatine for it to set but then in the end you might as well eat custard or mousse. It doesn’t feel like a real cheesecake to me. People can get a bit freaked out about baking a cheesecake because it’s harder to get a uniform density and texture, it has a tendency to crack and can end up a bit dry. But I don’t think it’s as hard as some people make it out to be and when you get it right, it’s a satisfying feeling. I’ve baked a lot of cheesecakes, refined my approach to it and I’m pretty confident that every time I bake a cheesecake, it will turn out fine. Even when I experiment a bit with the fillings. 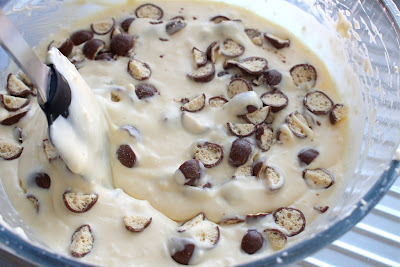 Don’t overbeat the mixture as it incorporates air into the batter which can cause the cheesecake to puff up and collapse, but if you underbeat it, it can lead to a lumpy texture and you want the mixture to have a smooth consistency. I beat everything at a low speed. I always make sure the cream cheese is really soft by leaving it to come to room temperature for a few hours or zapping it at a low temperature in the microwave for a 20-30 seconds until it can be easily beat and incorporated with other ingredients. You don’t need to bake cheesecakes in a water bath, this is a nightmare as everytime I’ve tried it, I’ve gotten leaks. I find that you get the same result by baking at a low temperature for a long period. I generally bake at 110-120C for about 1.5 hours. Then turn the oven off and leave the cheesecake inside the oven with the door slightly ajar to cool. Don’t worry if the cheesecake doesn’t look fully set after you take it out of the oven, it shouldn’t be. Cheesecakes are done with baking in the oven when the center of the cheesecake (about a 2-3 inch diameter) appears softly set and will wobbly slightly when you move it. 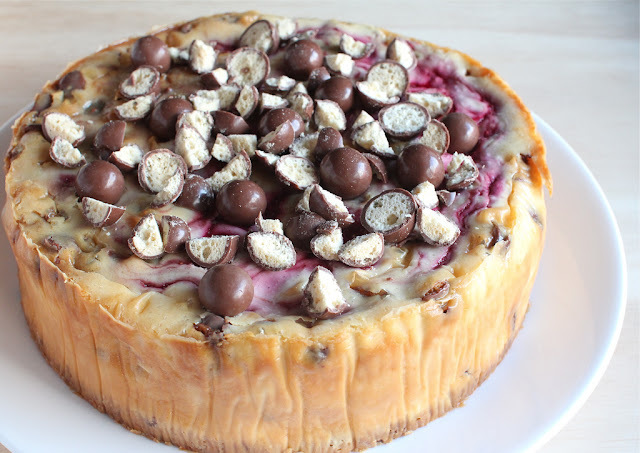 Because of the high density of most cheesecakes, they will continue to bake after it is removed from the oven, the texture will smooth out and firm up as it cools and is chilled in the refrigerator. It’s winter now in Perth and the one thing I am missing when baking cheesecakes it summer fruits. Recently, my younger sister asked me to bake her a cheesecake for her birthday. She requested a mango cheesecake and I told her that I wouldn’t be able to get any mangoes as they were out of season, then she asked if she could have strawberries but it’s not strawberry season either so I offered her the next best thing which was frozen raspberries and to make it just a bit more special I added in my sister’s favourite chocolates – Maltesers. 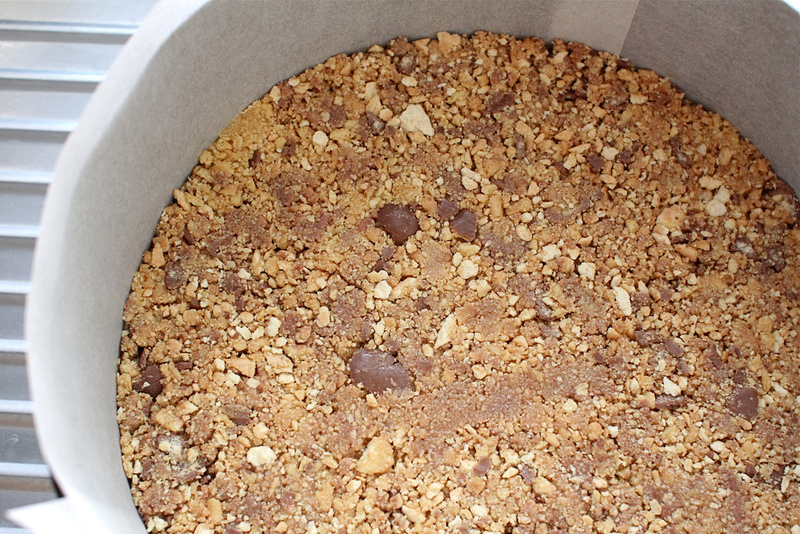 Line a loose-bottomed 20x5cm cake tin with greaseproof paper. In a processor, process the biscuits and maltesers together until the mixture resembles crumbs. Add melted butter and process a few times until just combined. Press the mix over the bottom of the cake tin to make a smooth, even layer (use the bottom of a glass to press). Put the soft cream cheese in a large bowl and beat in the sweetened condensed milk, thickened cream, vanilla extract and cornflour. Then add in the eggs and beat together until blended, smooth and there are no lumps. 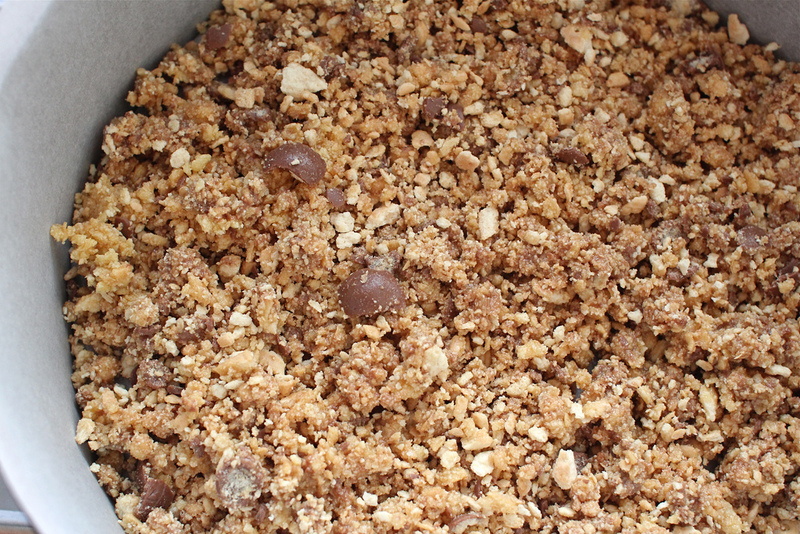 Add in chopped Maltesers, and gently fold through. 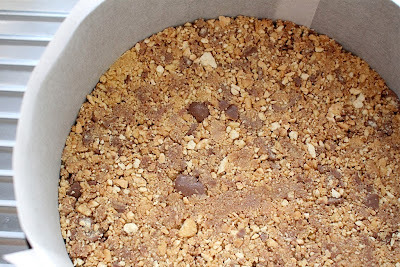 Then pour the mixture into the cake tin over the biscuit base. Drop the pureed raspberry by the spoonful on top. 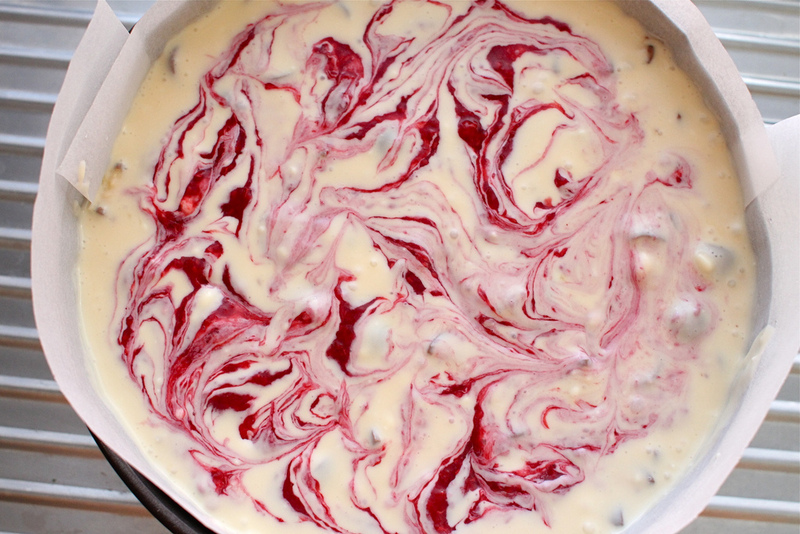 With a wooden skewer or toothpick, swirl the pureed raspberry into the cheesecake filling. Bake the cheesecake for about 1 hour and 30-40 minutes until it is just set but if you shake the cake tin gently it should still wobble a little in the center. Cool to room temperature, then refrigerate for several hours or overnight. Remove from tin, decorate with additional chopped Maltesers on top and cut into wedges to serve. With both my brother and sister (who are 6 and 8 years younger than me) my mum had pregnancy cravings for Sara Lee French Cheesecakes. To say I grew up on them would be somewhat of an understatement! Yours looks much much tastier though! 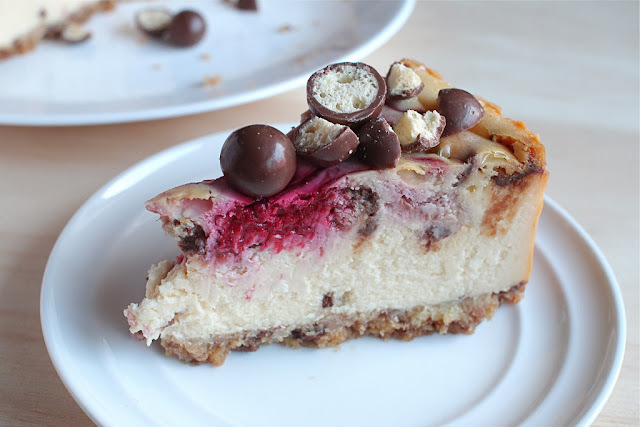 I need to make this cheesecake. I love a cool, creamy dessert and this one has extra bits to make me happy. Thanks Maureen :) My sister loved the maltesers on top! Oh boy this looks fantastic, Ai-Ling. 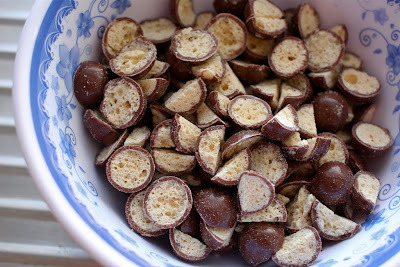 I love the combination of chocolate and berries but maltesers are my fave so this wins on all counts. Yummo! Thanks Christina :) The malt honeycomb centre wins! I like the baked raspberry and Maltesers cheesecake. Looks like yummy! Found this recipe a bit late, but am definitely trying it! My boyfriend's three favorite things: chocolate, malt, and raspberries. Looking forward to making this! Thank you! 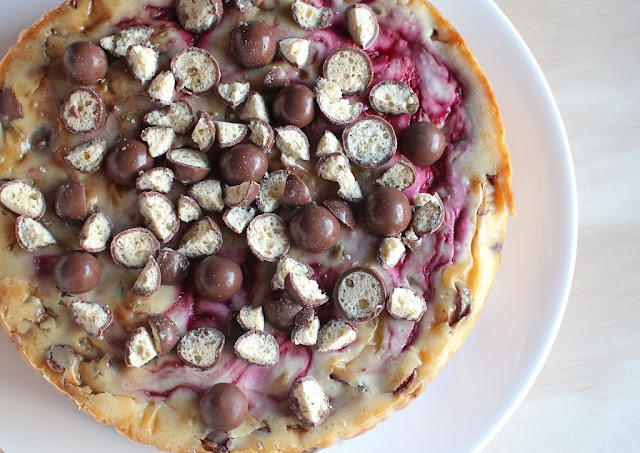 Thanks for dropping by :) It is my favourite kind of cheesecake too, I'm sure your boyfriend will love it when you make it!